A yummy smelling candle can literally light up a room. It also allows fragrant smells to waft through the air and elicits memories of people's favorite moments: the smell of fresh baked cookies, laundry blowing in the wind, a warm beachy day, lavender growing wild in a field and so much more. 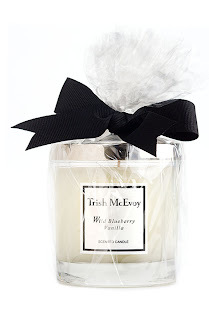 Trish McEvoy Candles not only create an elegant feeling and look with its stylish packaging (neatly tied with a sturdy black bow) but infuses a room with an absolutely decadent aroma. Even when the candle is unlit, the wax gives off a strong intoxicating yet delicious fragrance. The candles ($48.00, department stores) are long-lasting with their slow melting wax and create a warmth that permeates any home. The scents available are Wild Blueberry Vanilla, Egyptian Jasmine, Wild Fig and Orange Ginger. Each add a unique aroma that brings memories of luxuriously fantastic surroundings. My favorite scent is Wild Blueberry Vanilla and I love that I feel like I'm eating a scrumptious, creamy blueberry pie hours and hours after the candle has been blown out. A certain Beauty Buff's mother is obsessed with Egyptian Jasmine and stocks up on her favorite "can't live without, life changing" candles on a regular basis. My mother is also obsessed with the Egyptian Jasmine one! :) Yummmm, it smells so good! Is Your Skin Thirsty For Moisture? Try This! 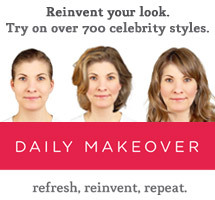 Tip of the Day: Primping Problems Solved! At These Prices, It's A Stila!